Yup. I actually put it in an empty simple green spray bottle because the Armor All I had was one of those bulk refill bottles. After washing the car I just spray it in the fender wells and forget it. Mine looks good even after I wash the car the next time, but I usually hit it again lightly. Sounds to me like you had better paint them, it's pretty apparent that you would rather paint. I doubt you'd be happy with the undercarriage spray. Me, I'd rather it be the way it came from the factory. Yeah, I'm thinking painting is the best way. I know after I sanded the paint overspray off with the steel wool, that you can see alot of flow lines in the plastic. I was thinking of the rubberized coating, but I don't think I'd like the look. And once that stuff is on there, it is on there. I'm gonna check out the Krylon flat black paint for plastic. I believe that will be your best option. Shan, do you find that Armor All causes the black plastic to go "gray" if not used continuously? That's what I found, so I stopped using it. As long as I kept the AA on there it was good, but if I got a little lax in applying it would turn gray. The VRT from Adams doesn't seem to do that. 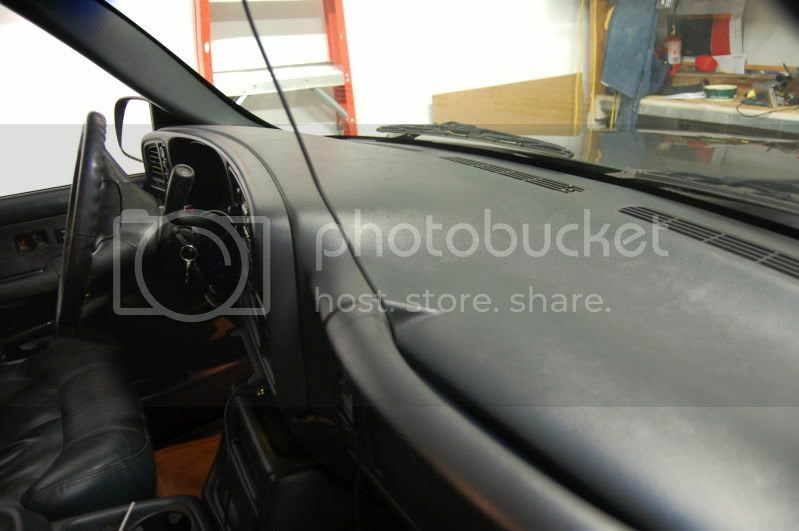 Do you use the VRT on the interior as well? I have some 303 protectant that I used on my hood seal. But it left the hood seal shinny. Which I was looking for a more matte finish, especially on the interior dash pieces. I had used Armor All inside in the past, and it left a haze and white streaks on the plastic. So, I've been looking for something to clean all the crap up, then something to protect it. I had been checking out the different venders I've been recommended. I was looking at getting it all from the same place, but I may have to break that up. As I had planned on also getting a carpet cleaner, and the Chemical Guys say their carpet cleaner also kills bacteria and mold and odor. Which I figure is a plus since I've had a water leak under the carpet that has caused mold growth. No other carpet cleaner I've seen says thiers also kills mold and bacteria, which also kills odor. VRT is the product you want. Not a glossy finish at all, just a natural looking shine. Here's a picture of the dash of my 99 Silverado (I don't have one of my Vette) VRT only about a week ago. Oh Yeah,I want 3 coats on her too Biff! Very, very pretty ride, Junk!!! I only use it when I go to a car show which isn't that often so I havent noticed any graying yet. I did some research over the weekend and found that if you lower the car so you cant see in the wheel wells you can't see the dirt. Mine is a C4, so you can see the wheel wells easily when you pop the hood. On mine though, it is crappy looking from a previous repaint that left overspray on the wheel wells. And obviously it wasn't prepped, and there are places where the paint has chipped off. I'm gonna strip them and paint them as the one I already stripped looks like a dull gray. I'm gonna strip them and paint them as the one I already stripped looks like a dull gray. Actually from the factory the panels are kinda dull gray,I just clean them up and Ice them! If they are painted they look Candy coated like somebody is trying to cover up something!But what do I know I'm a dealer other than if somebody dose a rattle can detail on one,I won't buy it!! It's too much work to clean that crap off and make them look factory and un-molested!! What is that pic supposed to be of? A crappy paint job, or the Ice job? Here's a pic of the one I stripped the paint overspray off of. It looks almost white. And did you ever find a good closeup pic of where you are putting your jack stands at? Actually that wasn't the photo I wanted,I was looking for one that had had the ICE wiped off after it dried!! I take apart and media blast some stuff that is really nasty looking, it turns the fiberglass pieces kinda white till I clear coat them with clear with flatting base in it,makes them purdy much look original!! Try a little clear on a spot and see if that gives you the look your looking for!! I haven't found any photos of just the stands position yet under a C4,I know I should have some.Just haven't run up on them yet! Do you think that back to black stuff I've seen mentioned might work? I may be willing to try something before I go paint them, but I don't want to waste money either. To make your plastics shine and your dark plastic darker...use PLEDGE Furniture Polish. Seriously, it works. I remember using Pledge on my cars that had vinyl tops. Many years ago. I forgot about using it. You are absolutely correct! The stuff works great! AFTER USING PLEDGE, PLEASE DO NOT FORGET TO SAVE THE !